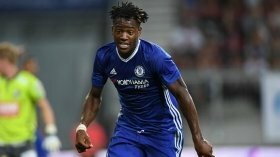 Chelsea to sell Michy Batshuayi to London rivals? Chelsea have reportedly offered Crystal Palace the opportunity to sign out-of-favour striker Michy Batshuayi when the transfer window reopens next month. The Belgium international was sent straight out on loan to Valencia during the summer after he was deemed surplus to requirements under new boss Maurizio Sarri. Since then, he has struggled to make a huge impression with just four goals across all competitions and this has increased suggestions that Los Che may terminate his temporary contract. According to HLN, the Belgian is likely to return to his parent club at the turn of the year and Palace could possibly pounce the marksman amid his struggles upfront. Palace recently picked up a shock 3-2 win over Manchester City on the road to distance themselves further from the drop zone but there remain concerns with the frontline with Jordan Ayew and Alexander Sorloth failing to impress. Moreover, Connor Wickham and Christian Benteke have struggled with fitness issues hampering them and this is likely to urge them to spend at the start of 2019. Batshuayi, who joined the Blues from Marseille more than two years ago, is also said to be attracting interest from AS Monaco, AC Milan and AS Roma ahead of the New Year.